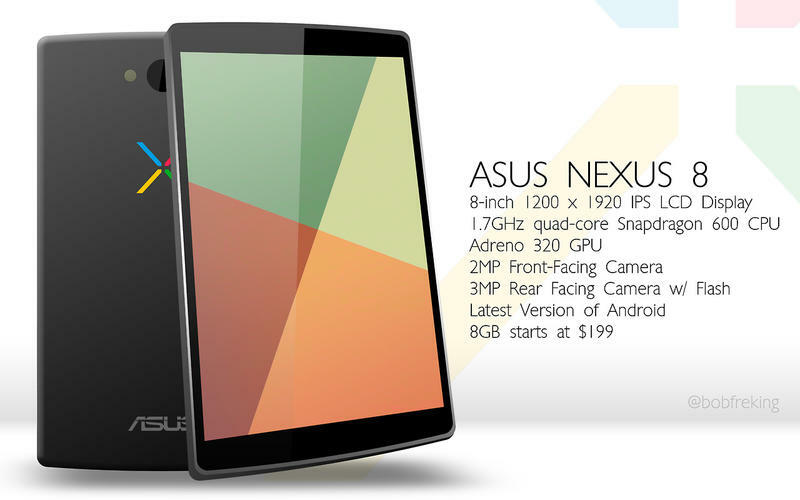 What might a Nexus 5 smartphone, a Nexus 8 or a Nexus 11 tablet look like? We might have to wait until next week to find out for sure, although it’s possible Google will simply update the existing Nexus 4 and Nexus 7. Still, that’s not stopping artists from taking pen to the pad to draft up some neat ideas. Conceptual artist Bob Freking recently drafted up three concepts, one for the Nexus 5, one for the Nexus 8 and one for the Nexus 11, and imagined what hardware each device might pack. Freking imagines the Nexus 5 will offer a 1.9GHz quad-core Snapdragon 800 processor, a 13-megapixel camera and a 2-megapixel front-facing camera for video chat. Oddly, he puts a slower Snapdragon 600 processor in the tablet, a 3-megapixel camera, a 2-megapixel front-facing camera and 8GB of storage. 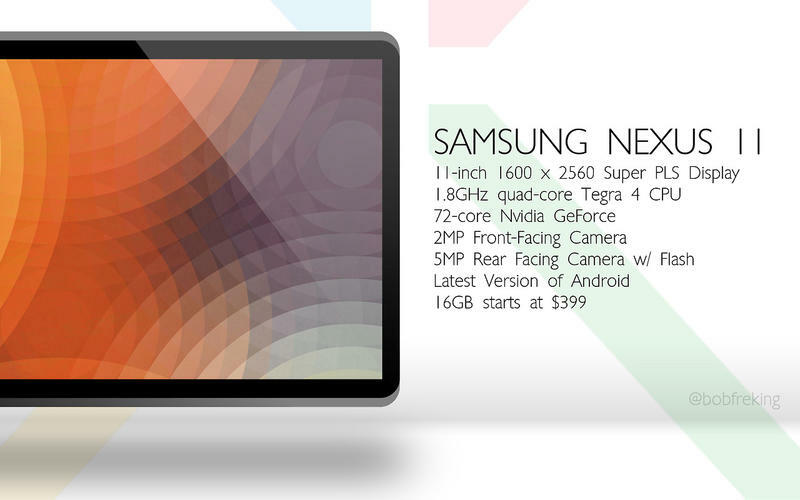 He also imagines an 8-inch display with a 1920 x 1200-pixel resolution. Lastly, Freking believes the Nexus 11 might offer a 11-inch 2560 x 1600-pixel display, a 1.8GHz quad-core NVIDIA Tegra 4 processor, a 5-megapixel camera, a 2-megapixel front-facing camera and 16GB of storage. 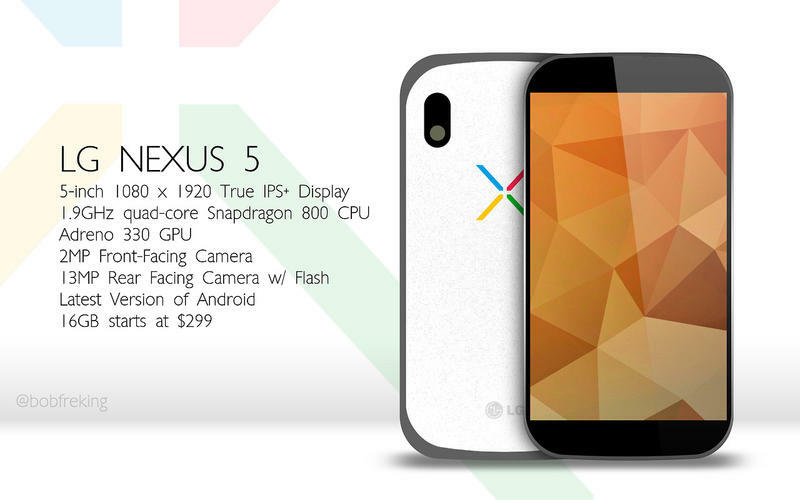 We’ll likely hear about Google’s developments on the Nexus front next week during Google I/O. TechnoBuffalo will be there reporting on all of the news live.